My schedule is getting busier with meetings and events, I don’t have the time to bake a batch of brownies or cookies. I don’t even want to turn on my oven on in this disgusting, humid heat we’re going through in NYC. To solve my conundrum, I found Chocolate Gourmet. 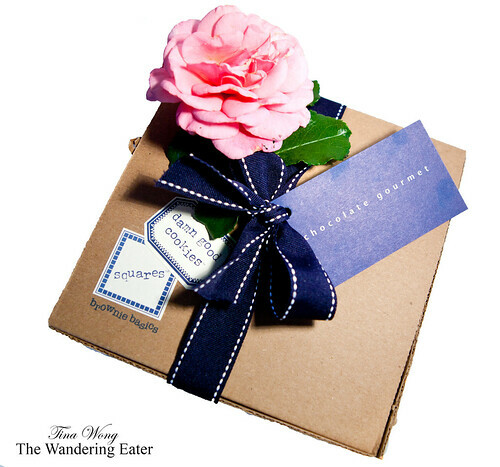 This Chicago-based company sells cute yet aptly named baked goods like “Damn Good Cookies”, “Squares” (brownies) and “Ugly Truffles” (chocolate truffles). Perusing though their site, I decided upon ordering their “Hot Stuff Box” ($47) just because it would survive the punishing heat while being in transit over to my doorstep. The goods came in great shape (as you see above) and they were all “damn good”, the plus was the fact they weren’t remotely cloyingly sweet. The controlling coconut cookie was a friend’s favorite (who is obsessed with all things coconut). It looks like Mexican wedding cookies except it is an incredibly coconutty, buttery, delicately flaky cookie. 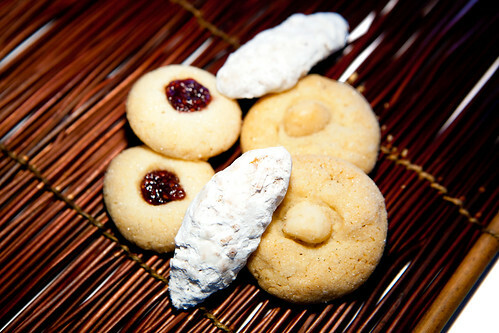 The Maternal Macadamia Nut cookie was wonderfully buttery and the crisp macadamia nut went along with the buttery cookie. The Rockabye Raspberry is my ideal bite-sized raspberry thumbprint cookie. Crisp, buttery with a slight crunchy coating of sugar with a superb raspberry jam in the center. 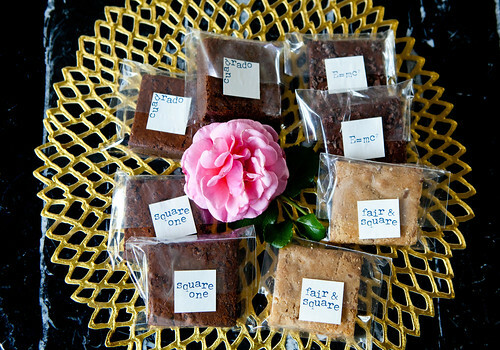 The brownies (Square One, E=mc2, Cuadrado) and blondie (named “Fair & Square”) were equally excellent. The brownies were overall, dense and moist like a great fudge brownie. I liked their basic brownie (Square One) for not being sweet despite being studded with chocolate chips. The E=mc2 and Cuadrado were my favorites since they were intensely dark chocolate brownies. E=mc2 was superb from the espresso/cacao addition that I enjoy the bitterness of these beans contrasted from the rich brownie. The Cuadrado was a sleek, sophisticated dark chocolate brownie. Everything in that box satisfied my sweet tooth that it didn’t last too long despite it survived the brutal shipping temperature.